It's softball season at our house! Daphne and Audrey are really excited...but Daphne is not happy that her team's color is pink. (How could I have a child that doesn't like pink?!?) Oh well-she did like this card though! Helle surprised me with this lovely gift this morning! 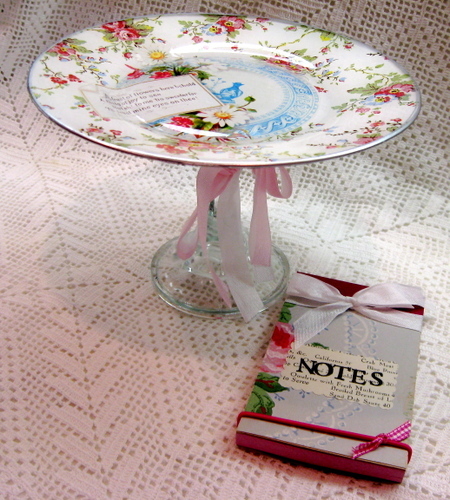 The beautiful plate and notepad are from the studio of the talented Jen Duncan. My "twin" Cindy Bakeman sent me these awhile ago. She knew how much I loved these houses and we have no Hobby Lobby here. 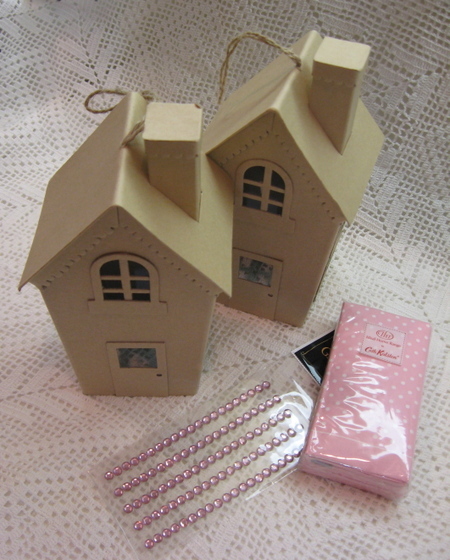 I can't wait to make another cute glitter house! Thanks girls!!! I'm so lucky to have such thoughtful friends! I can't believe how many cards I've had to make for my own use this week! I'm going to a baby shower tomorrow. I saw this on the A Muse gallery and made a few changes to the original. A Valentine card for Kevin's kindergarten teacher. She's been teaching about 28 years and three of my four kids have had her for their teacher. I could not be luckier!!! She is the BEST!!! I tilted the card a bit so that you can see the glittery Spica pens. I think that boys can like a little glitter too!!! 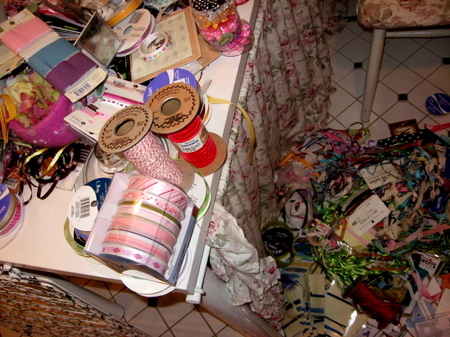 Here's what I'll be doing the rest of the day...sorting ribbon! 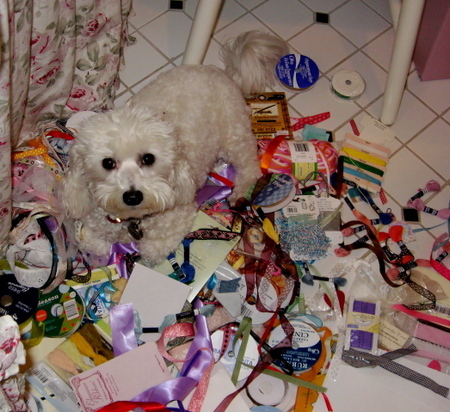 What ever made me think that I needed ALL this ribbon?!? I'm paying Audrey to help me. Mintie thinks she's helping too! 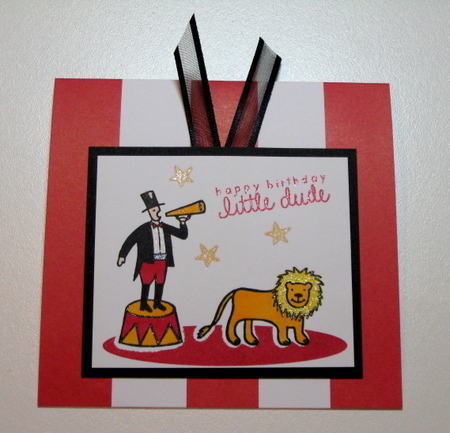 I was "inspired" by this card on Melissa's blog and HAD to make my own version! 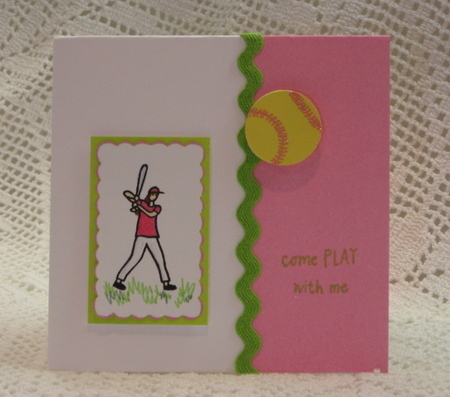 Melissa always has the most beautiful and amazing ideas for cards! I did not come up with the idea for this rabbit and the gifts. Someone from A Muse created the design...I just can't remember who! Sorry! This is my "lifted" version. I used my Copic markers and Spica Glitter pens. 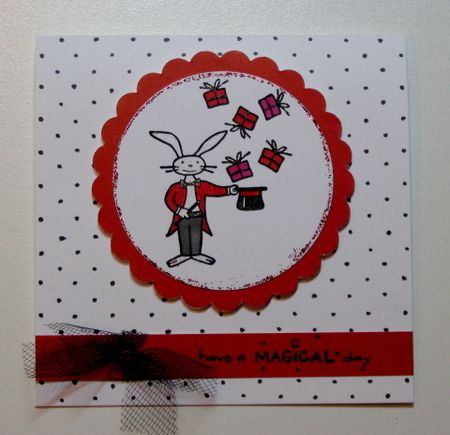 The red glitter around the circle is "Stickles". I haven't used this guy for awhile (Frog prince 2-1052B). He's always been a favorite of mine. 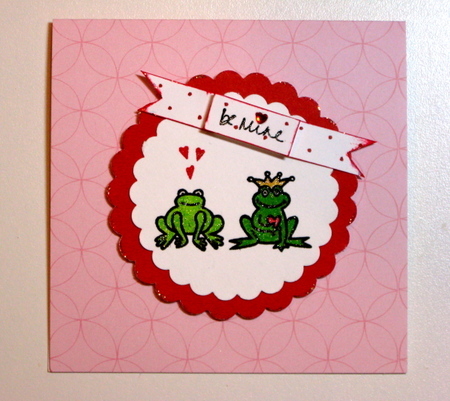 Then I remembered that A Muse had released another frog (Frog 3-084C) that would be perfect as his girlfriend! I think they're a cute couple! 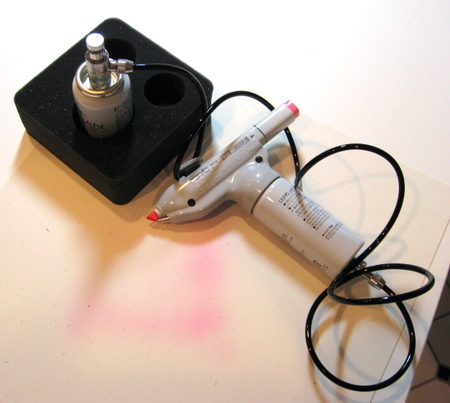 I am doing demos at the Copic booth at CHA so they sent me an air-brush system to try. I let it sit for awhile and finally opened it last week...and I LOVE it!!! It is awesome!!! (and soooo easy to use!) If you are at CHA come by the Copic booth to see my samples and demos and ME!!! This is a doily I used as a mask. 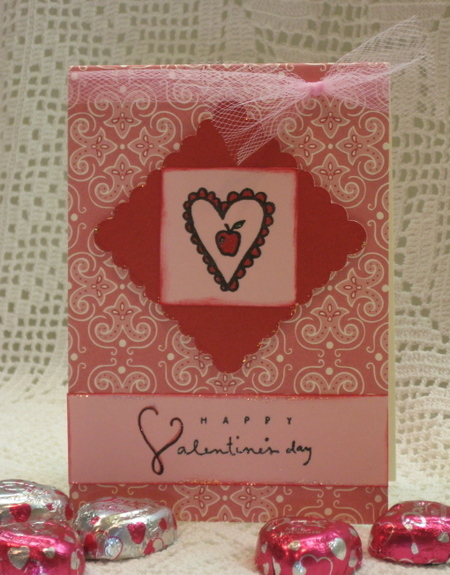 I put the doily on a piece of cardstock and used the air-brush. 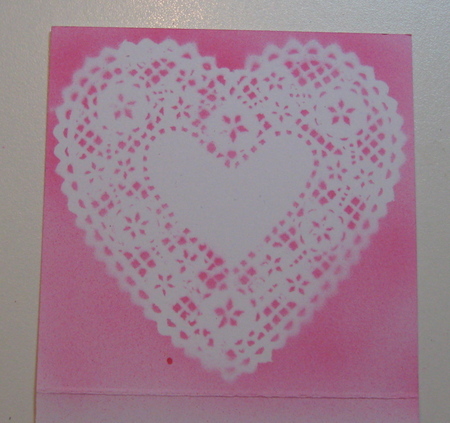 After I lifted the doily off the cardstock this was the pattern left behind! 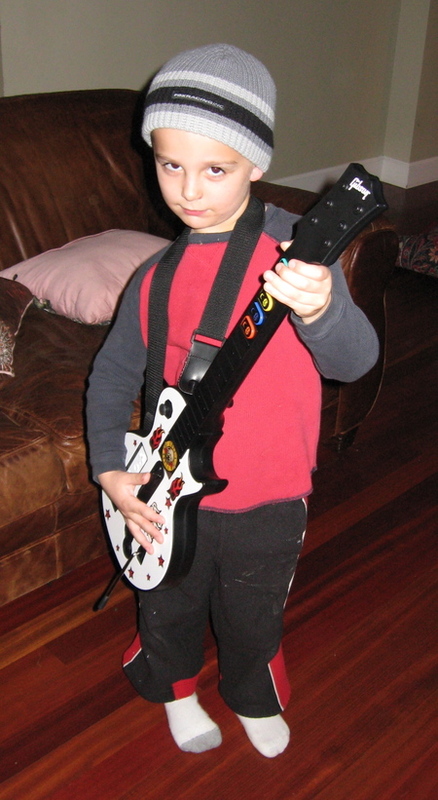 My kids have been "Guitar Hero" obsessed since they got a Wii for Christmas. Kevin has played like crazy, trying to keep up with the older kids. I had to take this photo when I saw him with the beanie on. He posed with what I guess he thinks is a "rock star" look. 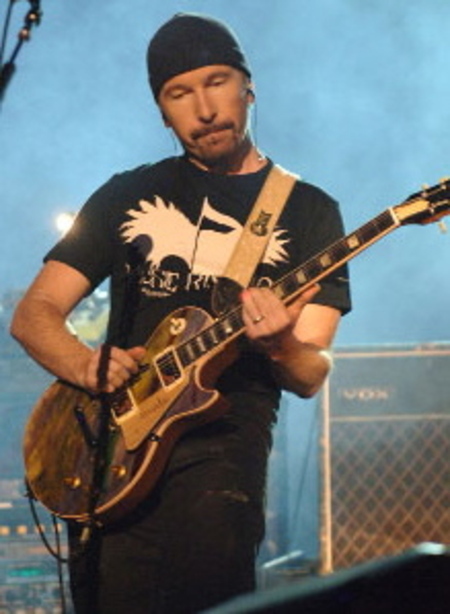 Then I realized that with the beanie he looks like "The Edge" from U2!!! See what you think?! ?